Do Eggs Need to be Refrigerated? They're Not in Thailand. Egg sellers serve customers at the Chiang Mai Gate market each morning in Chiang Mai, Thailand. 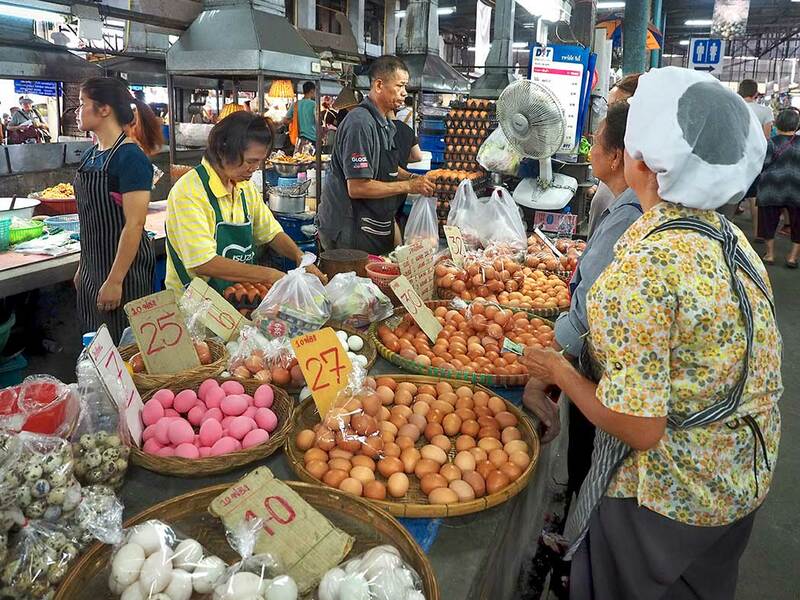 Unlike in the U.S., eggs are not refrigerated in Thailand. I’ve witnessed this all over the developing world, and in many developed countries as well. For example, eggs in the UK are generally not refrigerated. That made me wonder, “Do eggs need to be refrigerated?” A Google search provided an answer, though I’m not certain I believe it. Apparently, the question of whether or not eggs should be refrigerated has to do with the differing health regulations and processing methods. In the U.S., the Department of Agriculture (USDA) requires eggs to be washed and sprayed with a chemical sanitizer before being sold to the public. This, ostensibly, is designed to reduce the risk of salmonella infection. However some studies insist that washing increases the risk. The Food Safety Authority of Ireland, for example, says that washing eggs may “aid the transfer of harmful bacteria like salmonella from the outside to the inside of the egg.” Once an egg has been refrigerated, there’s no going back. According to the United Egg Producers association, “A cold egg left out at room temperature can sweat, facilitating the growth of bacteria that could contaminate the egg.” To learn more, check out this article in the Business Insider. Same in Germany and most european countries. Eggs are not refrigerated in supermarkets. And the risk for salmonella is really low here. But most people tend to put them into the fridge once they are home. I’m in the UK. Most people keep eggs in the fridge because there’s a special space for them in the door and it saves space on the worktop. However, this is the only reason. In the supermarket they are never in the fridge, just on the ordinary shelves. What I’ve noticed just recently though is that my egg boxes have ‘best kept refrigerated’ printed on them – even though in the shop they are not. As far as I’m aware the shell is the egg’s own protective ‘jacket’ and it doesn’t need anything else. If you are boiling an egg, the shell is much less likely to crack if the egg is at room temperature, so even if you keep your eggs in the fridge it’s best to get them out the night before if you’re planning on having boiled eggs for breakfast. I’ve never heard the thing about bacteria reproducing more quickly if a previously refrigerated egg is then left out. If it’s true, this might be one of the reasons supermarkets don’t refrigerate them. Hi Anne: It’s a mystery, for sure. We have some crazy health and food rules in the U.S., but our food is the most processed in the world. Go figure!